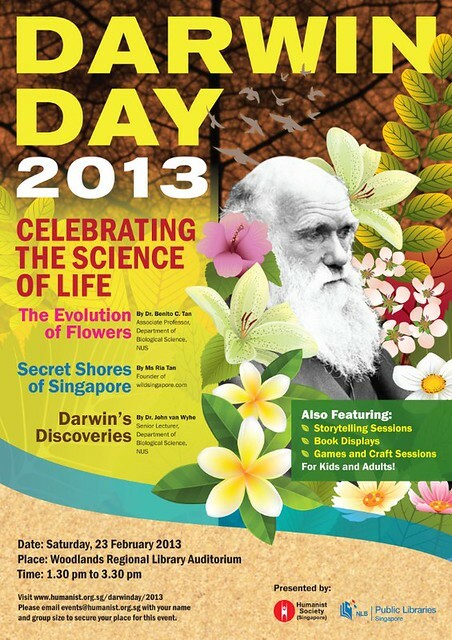 Darwin Day 2013 features lively and humorous speakers extolling the evolution of flowers, wildlife secrets of Singapore and Darwin's discoveries. There will also be storytelling, games and craft fun for children. Organised by the Humanist Society in collaboration with National Library Board. Admission is free at the Woodlands Regional Library, 900 South Woodlands Drive Woodlands Civic Centre #01-03, Singapore 730900 (take the MRT to NS9 Woodlands). Visit the Humanist Society webpage to RSVP or for further details.